Are you searching for CA Final revision test papers for November 2017? Then you have landed on the right page. In our previous articles, we have given CA Final Study Material and Practice Manual for Nov 2017. Today we are providing CA Final RTP for November 2017 attempt in both English and Hindi. Here you can also download CA Final Group - 1 and Group - 2 revision test papers of last 10 attempts. After you complete the revision of the whole syllabus at least once, you should solve the questions given in the CA Final RTP. For every examination, Board of Studies comes out with a Revision Test Paper. Revision Test Paper is issued for every attempt containing a fresh set of questions, which will help you to evaluate your preparation level. CA Final RTP is divided into two parts namely Part I: Recent amendments, notifications and announcements, which are relevant for that particular examination and is not given in the study material or was not applicable in the immediate past examination. You will be able to know all such relevant information applicable for the exam at one place. Part II carries questions and answers for your practice. The Institute's Suggested Answers, Compilation, Practice Manual and Mock/Model Test Papers may be very helpful for the students as they can go through the best possible answers for any problem. These publications not only provide you the appropriate solution to any particular problem but also enable you to have an in-depth analysis of that problem by highlighting Examiners' Comments as well. There is no reason not to repeat past papers as much can be learned this way. It is easy to think that once you have worked your way through the paper and marked it from the back; this will fetch much higher marks at another attempt. You would be amazed. Practice with as many different papers as are available. Now, you can download CA Final RTP November 2017, May 2017, May 2016, Nov 2016, May 2016, Nov 2015, May 2015, Nov 2014, May 2014, Nov 2013 in English and Hindi. I hope this article will help you download CA Final RTP from November 2017 to May 2013. 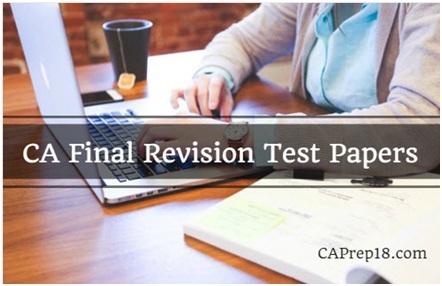 If you are facing any issue while download CA Final revision test papers, please let us know at contactus@caprep18.com or reach us at our Toll-Free number 1800-212-8575 we will help you. Also, share this article “CA RTP (Revision Test Papers) for Nov 2017” with your friends.